Address: Carretera Veron - Punta Cana, Punta Cana (Gran Santo Domingo), Dominican Republic. 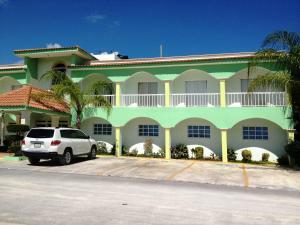 Felo Hotel is located 10 minutes’ drive from Punta Cana Beach and 9 km from Punta Cana International Airport. It features free Wi-Fi and free coffee service. The rooms have basic décor and include air conditioning and TV with satellite channels. The bathrooms are private and come with a shower. This hotel can arrange delivery food service. The restaurants located 5 minutes’ drive away are also an option for the guests. Felo Hotel is 15 km from Bavaro Lagoon and 10 km from Manati Park. Plaza Coral Shopping Centre is just 600 metres away and Bavaro Beach is 15 minutes’ drive away.